Former U.S. Rep. Jesse Jackson Jr. faces a maximum of several years in prison for conspiracy. 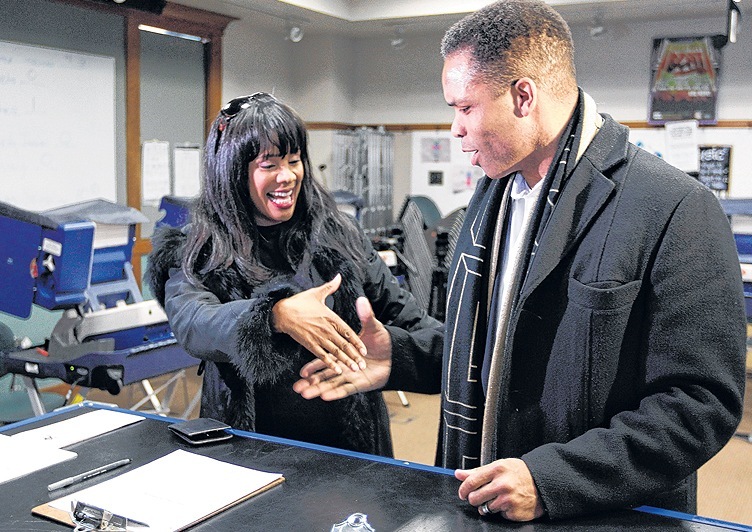 WASHINGTON – In a spectacular fall from political prominence, former U.S. Rep. Jesse Jackson Jr. and his wife agreed Friday to plead guilty to federal charges growing out of what prosecutors said was a scheme to use $750,000 in campaign funds for lavish personal expenses, including a $43,000 gold watch and furs. The son of a famed civil rights leader, Jackson, a Democrat, entered Congress in 1995 and resigned last November. Sandi, as she’s known, was a Chicago alderman, but resigned last month amid the federal investigation. Jackson used campaign money to spend on such things as a $43,350 gold-plated, men’s Rolex watch and $9,587.64 on children’s furniture, according to court papers filed in the case. His wife spent $5,150 on fur capes and parkas, the document said. Several messages left with Jackson’s father, the voluble civil rights leader Jesse Jackson, were not returned Friday. The elder Jackson has often declined to comment about his son’s health and legal woes over the past several months. The government said, “Defendant Jesse L. Jackson Jr., willingly and knowingly, used approximately $750,000 from the campaign’s accounts for personal expenses” that benefited him and his co-conspirator, who was not named in the one-count criminal information filed in the case. The filing of a criminal information means a defendant has waived the right to have a grand jury consider the case; it is used by federal prosecutors when they have reached a deal for a guilty plea. The prosecutors’ court filing said that upon conviction, Jackson must forfeit $750,000, plus tens of thousands of dollars’ worth of memorabilia items and furs. The memorabilia includes a football signed by U.S. presidents, a Michael Jackson and Eddie Van Halen guitar, a Michael Jackson fedora, Martin Luther King Jr. memorabilia, Malcolm X memorabilia, Jimi Hendrix memorabilia and Bruce Lee memorabilia — all from a company called Antiquities of Nevada. Tom Kirsch, an attorney for Jackson’s wife said she has signed a plea agreement with federal prosecutors and would plead guilty to one tax count. The court papers said that Jackson filed false financial reports with the U.S. House of Representatives in an attempt to conceal his and his wife’s conversion of campaign funds for their personal benefit. • Jackson and his wife carried out the scheme by using credit cards issued to Jackson’s re-election campaigns to pay personal credit card bills for $582,772.58 in purchases by Jackson. • In a false filing with the House, the owner of an unidentified Alabama-based company issued a $25,000 check to pay down a balance on one of Jackson’s personal credit cards. Jackson’s financial disclosure statement with the House omitted the payment made on Jackson’s behalf. • In a false campaign filing with the Federal Election Commission, an unidentified treasurer for Jackson’s campaigns reported that the campaign spent $1,553.09 at a Chicago Museum for “room rental-fundraiser.” In fact, said the court papers, Jackson spent those funds to buy porcelain collector’s items.